Fall in Indiana means hot apple cider, brightly colored leaves, and of course, pumpkins! It doesn’t matter if you’re looking to carve a scary Halloween decoration or bake up a scrumptious pie, these wonderful pumpkin patches have your back. Here are our favorites in Indiana! Adrian Orchards has been in business for over 90 years, and they are also home to the Guinness World Record holder for the fastest apple picker (365 and a half bushels to be exact!) in 1980. Join them in early October for their Annual Harvest Fest and make your way to the u-pick pumpkin patch to find the pumpkin of your dreams. From big to small, round to abstract, there is a pumpkin for every type! Kendall Family Farm is a third generation family farm located in the small town of Greentown, Indiana. Though their corn maze is the reason why people come to visit the farm (each year features a different theme and design), it’s their pumpkins that come in second. The farm has a u-pick pumpkin patch and the pumpkins are sold by the size rather than the weight, and come in all shapes and sizes. The creation of the Priebe Pumpkin Patch grew out of a few planted seeds and many curious preschoolers. Now, each October families throughout Indiana and Montgomery County make it a family tradition to visit the pumpkin patch in search of that perfect pumpkin. There are large varieties to choose from that weigh three to 75 pounds and include white, Cinderella, and the Long Island Cheese. Tuttle Orchards is a fourth generation family owned and operated farm and orchard, and have been in business for over 90 years. Each year they have over 20,000 visitors to the farm throughout the year. They have over 20 acres of pumpkins to choose from and are one of Indy’s favorite pumpkin patches. Bring your own little red wagon (or any color you like) or purchase one of their wagons instead. They have mini pumpkins, white pumpkins, and giant Cinderella pumpkins! If you’re looking for a quiet place to take the family this fall to get away from the hustle and bustle, come to the Stuckey Farm Market in the small town of Sheridan, Indiana. The market features 15 acres of some of the plumpest pumpkins you’ve ever seen, just waiting to be picked! They also offer educational tours as well. Welcome to the Pumpkin Kingdom, where the atmosphere is country and quaint, and see the beautiful fall season up close and personal in southern Indiana. Enjoy the rural, scenic drive and take in the charm of the pumpkins, straw bales, corn, gourds and welcoming scarecrows. But especially the pumpkins. They’re beautiful in color and come in all sizes. While you’re here, be sure to say hello to Pumpkin, the resident farm goat and Bray, they’re Sicilian Donkey. Wholesome Meadows is truly wholesome, where they grow local produce without the use of pesticides or herbicides and make all natural soaps and lotions. Every year from the middle of September to the end of October, visitors and their families can come and pick out their favorite pumpkin(s). The selections are endless and they also carry a wide variety of produce including strawberries, tomatoes, squash, zucchini and more! What makes the Knollbrook Farm in Goshen unique compared to other pumpkin farms is that it’s an actual working dairy farm that happens to also have some of the best pumpkins in the Goshen area to pick. There’s a pumpkin for everyone throughout the patch so be sure to bring your camera and take plenty of pictures! If you’re curious as to just how great your pumpkin could be, try it in the pumpkin sling shot and see who can be the first to dunk it in the floating inner tube. Now is the perfect time to pack up the family and head to Westport! Indiana, that is. Armand’s Harper Valley Farm has been providing custom farming services since the early 1940s, including no-till and residue management. Since then, they’ve expanded to pumpkins and have one of the best pumpkin patches in all of Indiana. 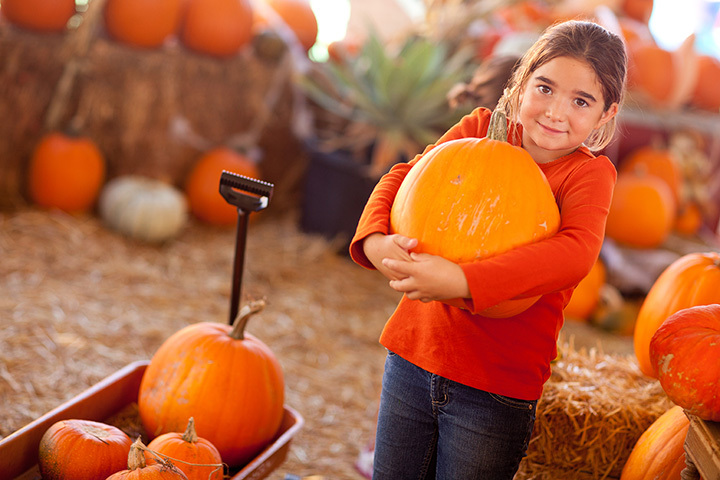 Wander through eight acres of pumpkins and gourds galore, and be sure to join them for their Annual Pumpkin Patch Days. The Stonycreek Farm is situated on a 1860s-era farm complete with 50 acres of rolling hills, farmland and woods. The creek that runs through the property gave the farm its name and used to be a Native American trade route and the site of an old gristmill. The farm has been in business for over 46 years and is now in its third generation. Join them in late September for their Annual Pumpkin Harvest Festival and take a beautiful old fashioned hayride to the pumpkin patch and pick to your heart’s content!